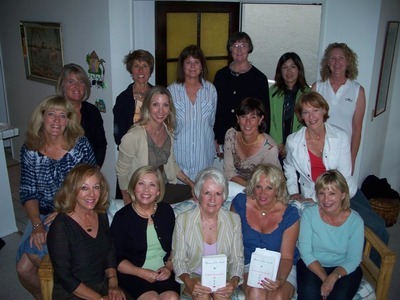 This book club calls itself the "Newport Newcomers." It's a way for newcomers to Newport, CA to meet and make new friends. (I probably didn't have to explain that to you, did I?) The ladies assured me they were gorgeous and would make a fabulous picture for this blog. I was also asked what tips I had for couples to get along if they do an RV trip like we did. Well, it just so happens that Tim and I wrote the Married Shrinks' Guide to Not Killing Each Other On Vacation. And, if you have any suggestions of your own to add, stick 'em in the comments. This page contains a single entry from the blog posted on July 11, 2009 1:37 PM. The previous post in this blog was What Makes A Book Club Great?. The next post in this blog is Three's A Charm.